The most delicious freedom comes from venturing beyond the assumptions that other people have made about you. The next decision you make can change the world. It’s a humbling thought but rapt with inspiration and hope. Rarely do we see the significance of our choices in the moment, it’s often only in retrospect that we see their power. Steven K Roberts never could have imagined the impact he would have on the world when he made the decision to give up security to pursue the freedom of traveling with a high-tech bicycle in the 1980’s. He became one of the founding visionaries for technology-enabled nomadicism and has spent his life forging it into existence. He is a pioneer and his legacy has inspired technomads around the world. This is the story of Steven K. Roberts, the original technomad. Like many of us, Steve had fantasized about the freedom of extended travel for years, but he was worried about the possible consequences of giving up the security of a steady income, his house, and a community of friends. At the age of 31 though, Steve had become so disillusioned with his suburban lifestyle that he knew he had to make a change. He shared, “the American dream I was living in Ohio consisted of doing things I didn’t really enjoy to pay for things I didn’t really want.” He explains in the beginning of his book, Computing Across America, “Suburbia is not a place; it’s a state of mind…You live in suburbia when the cycle of work and play become dangerously unbalanced in favor of work. You live there when your success is measured by dollars instead of happiness…” His work in high-tech consulting and freelance writing was engaging but the adventures he longed for were missing. His passion for nomadic travel could no longer be suppressed. He decided, “I’d get rid of everything, move to a recumbent bicycle, and travel the world.” About six months later in the Fall of 1983, after many late nights of planning, selling his house and most of his possessions, and building a high-tech recumbent bicycle, Steve pedaled away from Ohio embarking on what would become a life-long technomadic journey. For the next 18 months Steve rode his custom bicycle, dubbed the “Winnebiko,” 10,000 miles across the United States. The trip combined two of his greatest passions: electronic technology and adventure. His high-tech Winnebiko included such features as a built-in CB radio, solar panels, stereo, a laptop computer, and a security system that would page Steve if anyone touched his bike while he was away. Not surprisingly, the bike often drew a crowd as well as an incredible amount of media attention. The Winnebiko took him east through Appalachia to the coast, south to the Florida Keys, and west all the way to California. At last, Steve found all of the freedom and adventure he had always wanted. He witnessed in awe the ever-changing landscapes of the country he pedaled through. His journey brought him endless encounters with new and interesting people. Many times he found himself happily rolling into passionate affairs but was often pulled away by his continual love for “the Other Woman,” the open road. The myriad experiences transformed him and shaped the course of his life to come. After completing the trip Steve wrote Computing Across America. He realized that despite the financial troubles he faced during the trip, he had made it work. He found that he could have freedom and security while doing the things he loved. He couldn’t go back to the way of his old life. Steve had become a technomad and this was only the beginning. Not long after his first trip, Steve began planning another adventure as well as building a new bike. In 1986, after several years of planning and building, he took off with his “Winnebiko II.” This bike had, among a number of new technological features, a computer integrated into the bicycle and a keyboard on the handlebars so that he could write while cycling (he typed in binary). Using an early electronic communication system, he was even able to send email from the bike. He could now take his writing and consulting work on the road, quite literally. His romantic partner Maggie joined him on the 6,000-mile ride that covered both coasts. They followed this trip with another 16,000 miles driven in a school bus, while Steve offered guest lectures across the US. The stories from this trip are covered in his e-book Miles with Maggie. 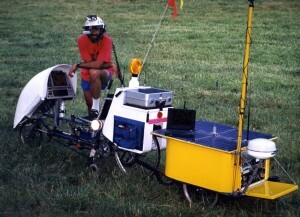 After completing this trip, he dedicated the next several years to building an even more highly advanced bicycle, named “Behemoth.” The 580-pound bicycle with trailer had multiple computer systems, a mobile phone capable of calling internationally, a printer, Ham radio, a small refrigerator, solar panels, and a custom helmet with a Heads-Up Display (a visor that flipped down in front of one eye to display computer text). It was the result of 3.5 years of work from 45 volunteers and about 160 sponsors to cover the bike’s $1.2 million cost. The bike was more of an experiment in mobile technology than in designing a user-friendly machine. It was only ridden about 1,000 miles before being donated to the Computer History Museum in Silicon Valley, where it now showcases incredibly innovative engineering of electronic equipment for its time. In the late 1980’s, it was truly revolutionary to be able to have this level of technological mobility. 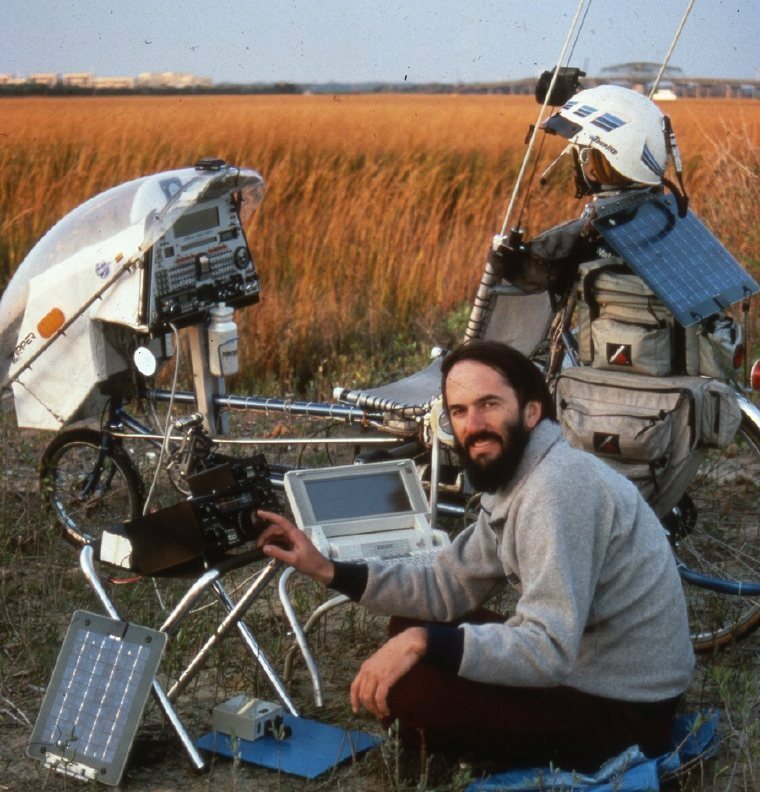 Steve’s passion for technological engineering and adventure remained united throughout the years but was not always bound to the roadways of the United States. Starting in the early 1990s’s, Steve shifted his focus from creating high-tech bicycles to designing, engineering, and even building high-tech aquatic crafts. His main projects in the 90’s were focused on a trimaran, titled “Microship.” Obviously this was no ordinary trimaran, it was extensively endowed with the latest technology. After years of invention, design work, production, and several sailing adventures, Steve decided to scale up. 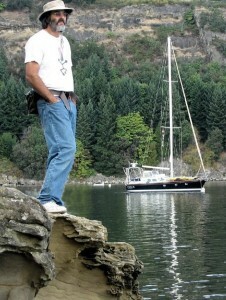 In Fall 2007 he purchased a 44-foot sailboat, the Nomadness, and has been working on integrating his technological designs to the boat since then. After the work is done, he intends to move aboard with his current partner Kirsten and travel the world. For almost the past 30 years Steve has been creating innovative technologies that enable a nomadic lifestyle. The stories of his nomadic adventures and technological innovations that have been shared here only scratch the surface of his vast experiences. He has created a legacy and these experiences offer valuable lessons that we can apply in our own nomadic journeys. In creating your own nomadic adventure, Steve suggests to “remember that you are primarily responsible for your own life and not responsible to fulfill other people’s expectations.” As he states in the inspiring essay The Heart of Nomadness, “The most delicious freedom comes from venturing beyond the assumptions that other people have made about you. The real prisons are those of expectation: denying the possibilities of your life in order to be what somebody else wants you to be.” Steve shared that the biggest thing holding people back from pursuing their dreams of nomadicism is a fear of failure, a fear of change, and learning to overcome social pressures. When Steve was formulating his plan for his first bike trip in the early 80’s, his family and friends were very skeptical and, at times, critical. He remembers his mother’s first words in response to the idea of his trip: “Are you going to be a bum your whole life?” Key to pursuing our passion is letting go of following other’s expectations and being open to embracing the changes we desire. When low on motivation, he finds ways to inspire himself by going back to the things that invigorate him. He shared that anytime he just takes his boat out for a short trip, he gets excited and inspired again. Steve recommends, in his e-book Miles with Maggie, “Life is only once, and slips by so smoothly that you can get away with coasting through a whole career and still look pretty good. Find what you really want. Grasp it with unshakable passion and focused desire.” The more we are connected to our passions, the easier it will be to stay motivated. Steve explained that key to a nomadic lifestyle is “making the adventure intrinsically self-supporting.” Before his first trip he made a list of things he enjoyed doing and spent time just staring at it, pondering how to combine them into a doable lifestyle. He explained that you have to find your intrinsic abilities and interests in order to find how you can leverage them to financially support yourself as a nomad. Encouragingly, Steve shared that he has witnessed that “everything can be leveraged to support a life of travel.” He shares more details of levering your skills, specifically on engineering, in his newest book Reaching Escape Velocity. Are your driven by your strengths and passion? Too often we focus on our weaknesses and work hard to minimize them. What if we became more aware of our strengths, and instead, worked to gain skills and knowledge in our areas of interest? What if we allowed our best selves to do the work we were born to do, regardless of societal criticism? What if we trust our talents to lead our journey and believe that we’re only steps away from living the life we imagine? A friend just sent me the link to this site and the Facebook group. My family and I have been Tech Nomads for the last year – before we even know what it was! Great to read about other like-minded folks, especially Steven. We’ll have to check out the books! Great article. I have been following technomadics for a number of years now. I follow a number of technomads on the Internet, even a few who haven’t adopted the title but have adopted the life style. Indeed, with the growth and adoption of mobility in many aspects of life technomadics may become the way of the future even for those who don’t think they would care for the adventure. Evolution can be like that. I’m so glad you liked it Steve and that it’s holding up the mirror to keep you inspired. 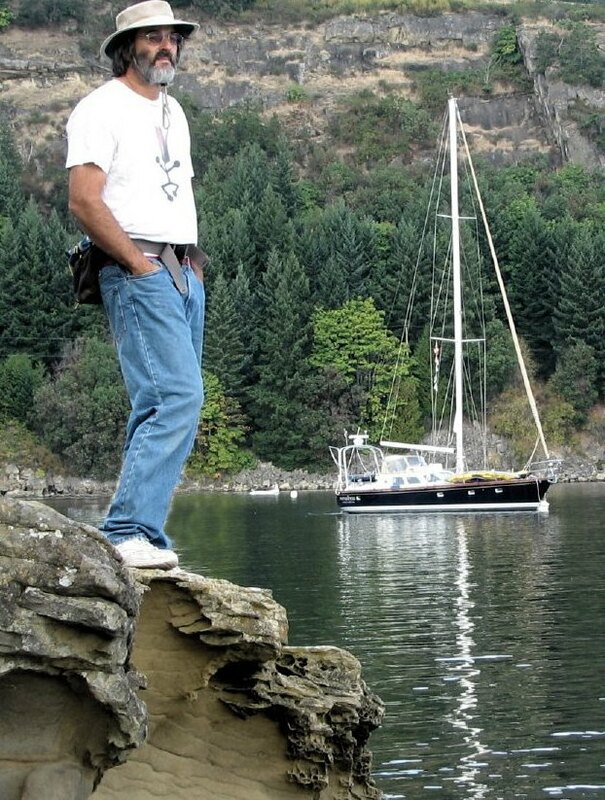 Thanks so much for the article, Karl – it is very motivating at the moment, as I’ve been bogged down for too long by a logistical deadlock (3000 square-foot lab deep in the forest versus 18-ton sailboat at a distant marina), along with other lifestyle stuff that can take the wind out of sails. But I have just sold the facilities assembled 13 years ago for the Microship project, and relocated the lab to a building at the head of the dock where Nomadness is moored. This is more like it… focus on the current project has returned (and would frankly be kind of hard to ignore, given the sailboat bobbing impatiently in my front yard!). Your article hit the spot, reminding me of the central passion that got me out the door all those other times. Thanks for holding up the mirror, and for the kind words. Speaking of the Microship, by the way, it is looking for a new skipper. Perhaps your community here harbors an aquatic geeky technomadling who could make good use of an insanely high-tech amphibian pedal/solar/sail micro-trimaran. This machine has yet to fulfill its expedition destiny, having only meandered around the Salish Sea, and I’d love to find someone who can take up where I left off on this intense project (see microship.com for photos).